Reviews of a website and online citations for businesses are growing in importance more everyday. People go to reviews to determine ore than any other venue whether or not to patronize a business or service. Review sites weigh heavily regarding position in the search engine ranks so the importance of getting good to great reviews cannot be understated. It’s part of your local SEO strategy that cannot be ignored. That all being said, on occasion an unhappy customer or competitor acting in an underhanded manner will post a negative review about your goods and services and you had better jump on it asap. A bad review can be the difference between success and failure for a business and the remedy for it calls for calm, resolve, and facts. 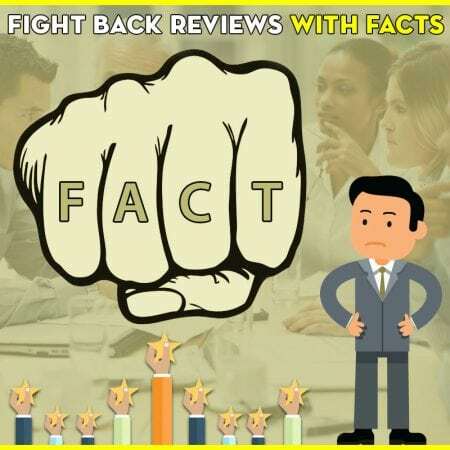 Facts are the only way you can fight back but far too many webmasters and marketers ignore this and get involved with either arguing with reviewers or review site owners. This can turn into an ugly mess that not only confuses the public but shows that you’re not willing to handle things in a respectable manner. This is why you have to have your cool in place and deal with such reviews with the right candor and factual information. Add to that making restitution for a disgruntled customer doesn’t mean they’re right, but it means you’re willing to accommodate them and appease them regardless of who is right or wrong. An example would be your business has 100 great reviews. The reviews cover many of the SEO parameters that make your site go to the top of the search engine pages. Suddenly, out of nowhere a review pops up with a customer raging to the wind. They’re so angry you can see he slobber foaming at their mouths. Anything can set off a customer such as a discourteous staff, late shipping, damaged goods and more. The key to resolving this is to nip it in the bud right then and there and set a public example that you not only care about the complaint but you care about the customer. Joe Smith posts a review about your company that is scathing. He may not have put all the details in the review that gives you an idea of what his problem is. You can contact him offline via their email or just battle the problem out in public. Joe Smith might be peeved about how the item arrived a day after his granddaughter’s birthday. He wants a refund. He wants an apology and so on. The whole world is watching and it’s time for you to go to bat. You first chill him out with an apology but you back that up with a promise to get to the bottom of things. Yes you’ll have to bite the bullet and give him his refund, but you sweeten the deal with sending him an extra toy for his granddaughter and make sure the public sees this. You show your shipping info that shows you mailed it on time and that the fault was due to some weather problems or the post office in his area. He’ll suddenly realize his irresponsible rant was uncalled for, and not wanting to look like a fool in front of everyone else, hell accept the apology and gift. People will see that you were in the right in the first place but you bent over backward to accommodate him, more than it was called for. This is remedial negative review strategy that can turn the tide in your favor but quick. Soon, that negative review will turn into a glowing display of your top level professionalism and customers will boast about it on social media thus furthering your search engine presence. Facts, facts, facts. Use them as soon as trouble arises regarding a review even if the facts be damning of you. It’s better to invest a bit more in peace and tranquility than lose reputation and customers. So do your due diligence by bringing in a company well oiled in such matters like Local SEO Tampa. There’s no online emergency that they can’t handle and having them at your side means you can deal with any disaster ok like an online review with cool and comfort.